As an SJ type, Anna tends to process new information through the lens of the past. And her less-developed functions fit the ESFJ type as well. 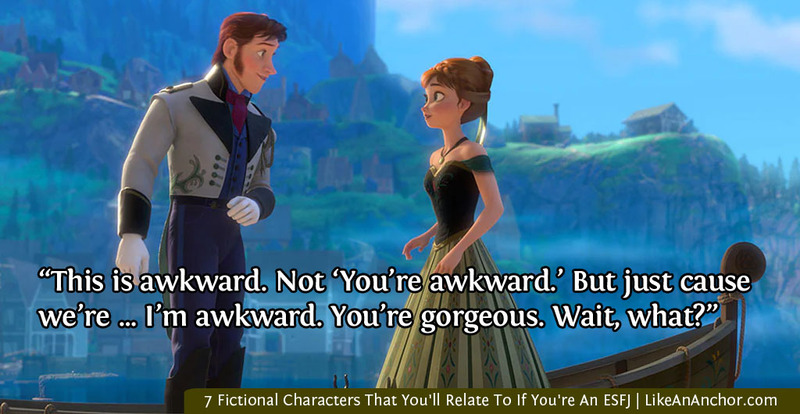 When she’s stressed out or uncomfortable, you see tertiary Introverted Intuition and Inferior Introverted Thinking as she talks before thinking (like when she and Hans meet) and panics about the future (after Elsa throws her out of the ice castle). For a more thorough discussion of why I type Anna as an ESFJ, click here to visit my Updated Disney Princesses MBTI Chart. 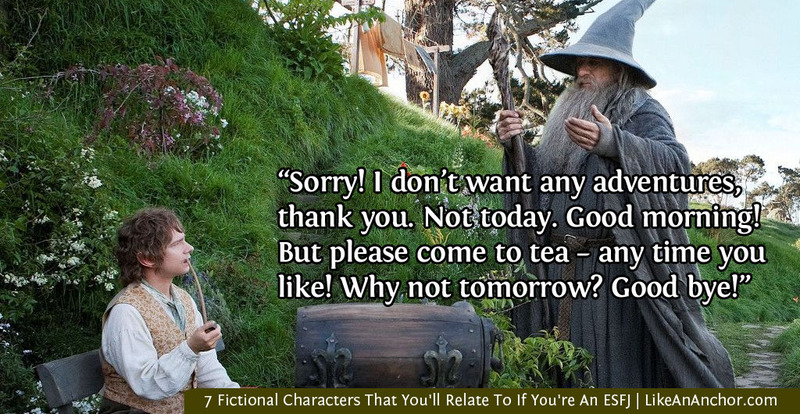 I’m sure Bilbo isn’t the only ESFJ to have someone take advantage of his hospitality. ESFJs tend to be sociable, outgoing, friendly people ready and willing to help those in need. That doesn’t mean they like it when people exploit their good-naturedness, but they still feel obligated to respond in the way that’s socially correct. Note how Bilbo reacts to the arrival of all the dwarves — he is not shy letting them know what he thinks about their unexpected arrival, yet he still plays the perfect host. Like other types with Introverted Sensing as an auxiliary function, ESFJs can become set in their ways and comfortable with routine, which explains Bilbo’s initial reluctance to leave his house or have his routine disrupted. But with tertiary Extroverted Intuition (and some time to get used to the idea) he turns into quite a brave little hobbit. 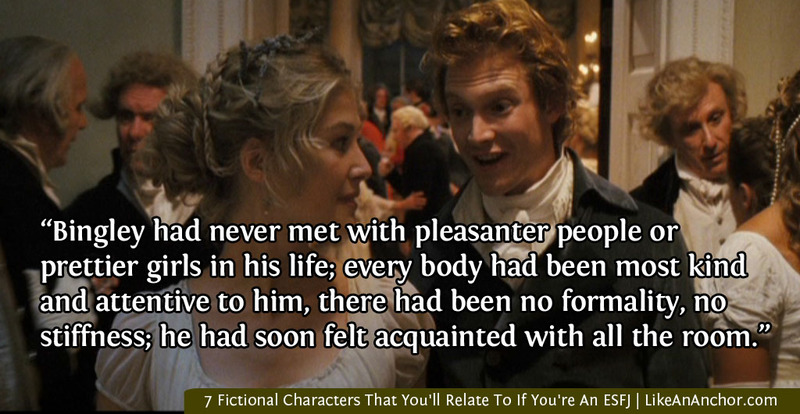 Like many ESFJs, Mr. Bingley from Pride and Prejudice “was sure of being liked wherever he appeared.” He’s eager to assume the best of people and to make friends. After his first social event in Meryton (Chapter 4), Bingley is left with the impression that “every body had been most kind and attentive to him … he had soon felt acquainted with all the room.” INTJ Mr. Darcy found no one to interest him and walks away with an entirely different impression, but Mr. Bingley assumes everyone he meets will be interesting and so they are. Have you ever seen one of those “Which dog breed are you based on your personality type?” posts? They usually match ESFJs with golden retrievers or Labrador retrievers. It might be because one of my friends has a dog named Bingley, but that’s always what I think of when I think of when I think of Mr. Bingley. He’s just so people-oriented, friendly, enthusiastic, and devoted in such an adorable way. He’s also intelligent, though he tends to underestimate himself and defer to Darcy’s judgement. Diana from Anne of Green Gables may be more of an ISFJ than ESFJ, but even if she is that would still mean she uses the same functions as an ESFJ (just in a different order). Either way, I’m sure many ESFJs can relate to her character. Diana is warm, friendly, and outgoing. Like most ESFJs, she’s very concerned with how other people see her and whether or not the things she does fit into the established social order. She’s probably especially relatable for young ESFJs, many of whom can sympathize with her desire to be a good daughter, a good sister, and a good friend. 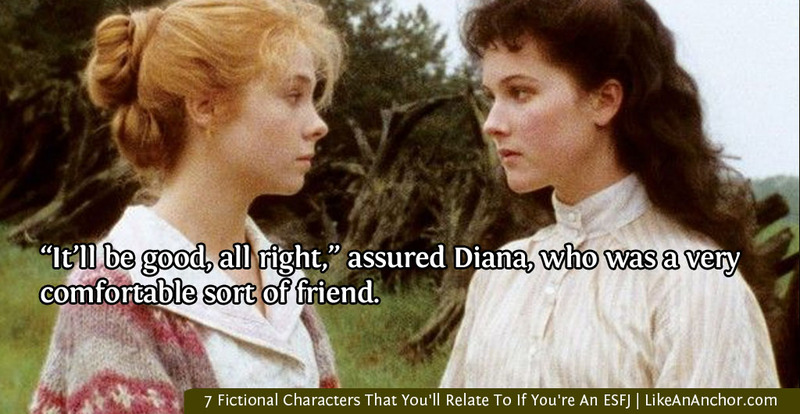 Diana is best known for being the main character Anne Shirley’s closest friend. One of the things that makes ESFJs such a good type to befriend imaginative NF-types like Anne is that they use tertiary Intuition. While ESFJs are not as vividly fanciful as an Extroverted Intuitive like Anne (at least not in the same way), ESFJs can readily appreciate imaginative storytelling. And they also have a practical contentedness to the real-world that can bring their more abstractly adventurous friends back down to earth when we need it. 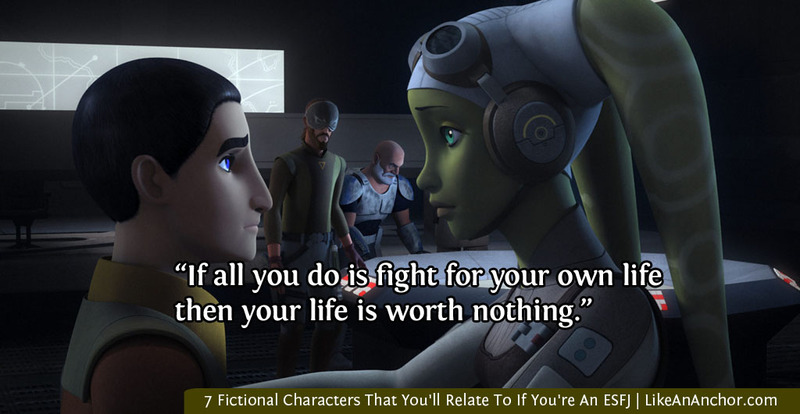 Hera from Star Wars Rebels is a fantastic example of an ESFJ type. She has that Si-Fe blend of prioritizing other people’s good while working to maintain social order. SFJ characters are often stereotyped at the “mother” figure and we get to see why in the way Hera leads and cares for her crew, especially in the first two seasons. As is typical of a dominant Extroverted Feeling type, she puts extra effort into maintaining harmony among her crew, even if it means sending them on a wild meiloorun chase so they can bond. After Hera’s rebels become more involved with the larger rebellion, we see that she’s concerned with helping the galaxy as a whole and not just a single planet or system. This is partly an SJ’s commitment to order, and partly an Fe type’s concern for people. But I think it’s also a little bit of her tertiary Extroverted Intuition looking at the larger picture and future implications of their actions. I’m sure many real-life ESFJs can relate to her desire to help other people and create a better future for people. I felt I had to include one of the ESFJ superheroes on this list, and I decided to go with Supergirl. 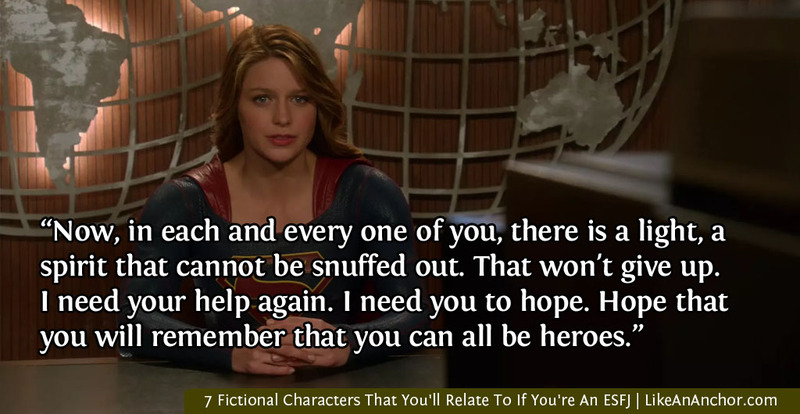 Kara Danvers is a good example of ESFJs as highly responsible people who care deeply about doing what is right and protecting others. She loves interacting with and inspiring people and, as with many real-life ESFJs, people enjoy being around her. Because Kara is rather socially awkward, she also demonstrates that not all FJ types can interact with people easily, as we often assume. In fact, EFJs (particularly young ones) “can be surprisingly awkward in social situations … Until they know how to gauge people’s expectations well enough, they’re self-conscious and reluctant to take action” (Thomson, Personality Type, p. 334). That’s where we meet Kara in the first season of Supergirl, and it’s interesting to watch her personal growth journey in that area as she continues to figure out where she fits in. Dr. McCoy from Star Trek is another lovely example of an ESFJ type. He’s also a great character to demonstrate that the extremely friendly, “motherly” stereotype doesn’t apply to all ESFJs. Some show their deep concern for their friends and desire for harmonious relationships in a more “prickly” way. 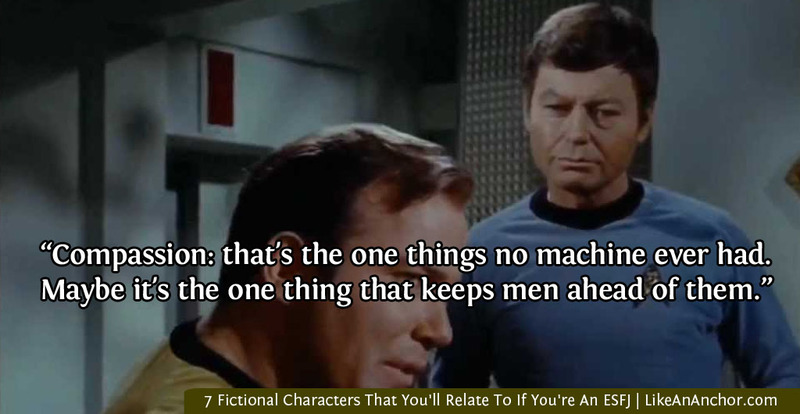 In her book Personality Type: An Owner’s Manual, Lenore Thomson uses Dr. McCoy as an example of “the quintessential Feeling type” who “reasons by way of human values, which dictate that relationships and people’s reactions be taken into account when solving a problem” (p. 43). ESFJs who recognize that their Feeling side is a valid method for making decisions and presents a valuable perspective will relate to Dr. McCoy. And they’ll probably also relate to his frustration at being around so many people whose ways of approaching the world conflict with his own. What did you think of this list? 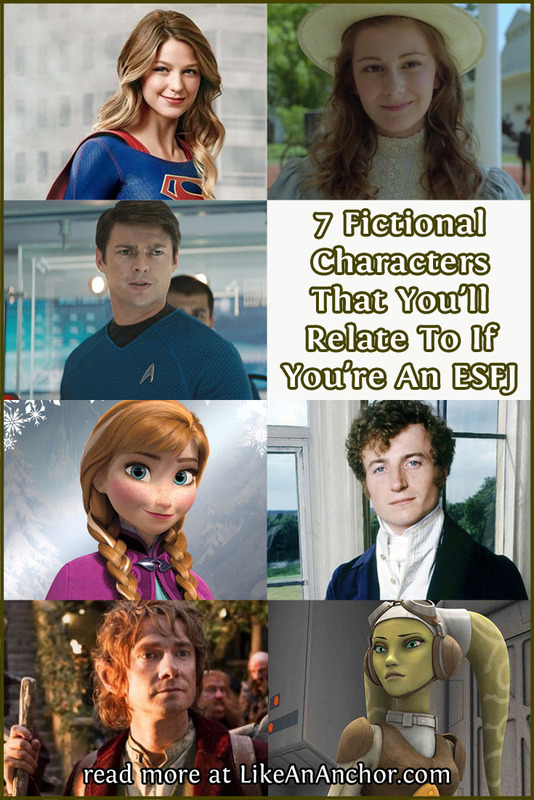 If you’re an ESFJ, which fictional characters do you relate to best? Is there anyone you’d add to or take off of this list? I’d love to hear your thoughts! ← Are You A Good Person? and What Does That Even Mean? My sister’s an ESFJ . . . she relates to Anna (reluctantly), Hera Syndulla (cuz she’s cool) and McCoy (slightly . . . he’s a bit too grumpy). The rest she doesn’t know about.